After receiving a referral from one of our long-standing customers for tank insulation, we were contacted to consult on a large, sphere-shaped propylene storage tank. After visiting the site in Louisiana, we discovered asbestos containing material in the existing blanketed insulation and it was so old and weathered that some parts were even falling off the tank. Due to the shape and complexity of the tank, this was a perfect candidate for a complete removal of the old system and installation of a new polyurethane foam insulation system. Safety was a key component in working with this new customer as they expect their outside Contractors to go above and beyond OSHA standards through specialized training and implementation, which we were able to easily achieve. Besides the shape and size of the tank, the customer had a very tight schedule. On top of it all, the project began in October, which meant that inclement weather was quickly approaching. Universal Coatings committed to working long days with multiple crews and very little time off to meet their needs. With our experienced employees and extensive planning, we were able to successfully complete this project way ahead of schedule! Universal Coatings attended the Jobwalk for this building and found the specified roofing system to be unsuitable based on the existing roof and needs of the Owner. After some discussion, we were able to refer the Owner to a quality roofing system that met the Class A fire rating requirement and provided an insulation value of R-13. After competitively bidding the project, we were able to secure the project with a reasonable price. The roof was 31,000 square feet with 34 skylights scattered throughout that were replaced with new OSHA-compliant skylights. With the roof being so large, there was concern about inclement weather, including random thunderstorms. 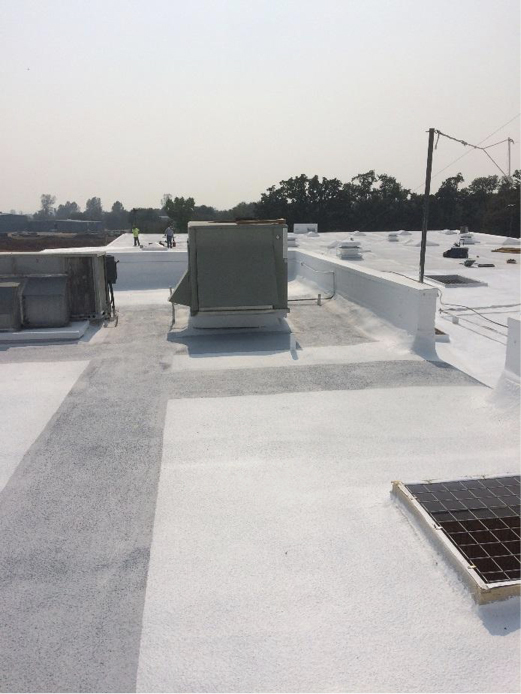 To mitigate these concerns, we were able to efficiently run three separate crews to remove the existing roof, install Dens Deck, and apply the new SPF roofing system, effectively sealing the roof in sections. The challenge was working within the airport where close attention was payed to preventing FOD from entering the runway and avoiding disturbance to air traffic. After five short weeks of work, the roof system and new skylights were successfully installed and completed!